Garibaldi's has been a locally-owned Memphis tradition serving quality Italian cuisine at affordable prices since 1975. Since opening the original Garibaldi's Pizza on Walker Avenue near the University of Memphis, I have opened two other locations: one in Germantown at the Market Square Business Center the other on Mt. Moriah Road in the heart of East Memphis. All three stores offer dine-in, carry-out and home/office delivery, as well as catering options. In all, we've been employing members of OUR community at each of these locations for nearly 40 years!! At Garibaldi's we have always striven to provide excellent customer service, serve quality products at reasonable prices and maintain a family atmosphere, both for customers and employees. Our menu has been specially designed to suit nearly everyone. We offer handmade pizzas, fresh salads with house dressings, sandwiches and pastas with your choice of sauce, as well as an array of appetizers and desserts. Our breads, doughs and sauces are prepared in-house daily using only the finest, freshest ingredients. 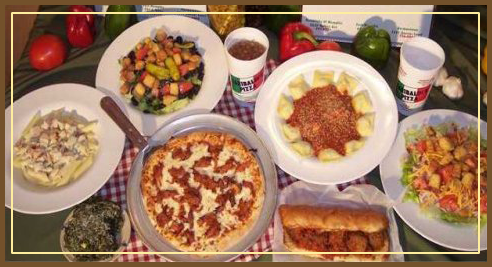 Whether you are on your lunch break, on your way home from work, at home with the kids or planning a corporate luncheon, make Garibaldi's Pizza your choice! Thank you for visiting our site and come back anytime!